The video may be a more than a decade old. It's part of a trove of video footage unearthed by Los Angeles-based animal rescuer Mary Cummins while she was transferring some old files. But it serves as a timeless reminder that all the great things we do in this life start small. And sometimes, furry. 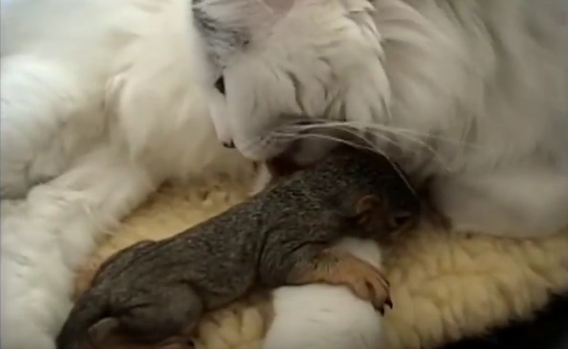 In the video, posted on YouTube last December, a baby squirrel can be seen soaking up a cat's tender tongue-bathing. According to Cummins, her cat brought in two baby squirrels from her yard and became a doting mother to them. The squirrels, of course, have long since been released back into the wild, and have hopefully lived long, fruitful (and nutful) lives. But even more importantly, her cat's sweet ministration inspired Cummins to become a wildlife rehabilitator. Through her nonprofit rescue, Animal Advocates, she has rescued thousands of animals: coyotes, bobcats, foxes, opossums, skunks, squirrels, moles, voles, mice, rats and bats. Responses to "Cat Finds Baby Squirrels Without A Mom And Knows What She Has To Do "